Let’s start thinking again from the children’s point of view! A modular element that can be placed side by side in a row! It takes a mould weighing 800 kilograms to produce contemporarily the seat of a Flowerssori chair and this element; an extremely versatile piece, here shown in its variant as small table. The Flowerssori small table is therefore physically born at the same time as the Flowerssori chair and its peculiarity is that it is a modular element. 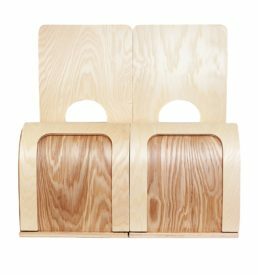 These tables are shaped so that they may be placed side by side or assembled should the need to augment the children’s work surface arise. 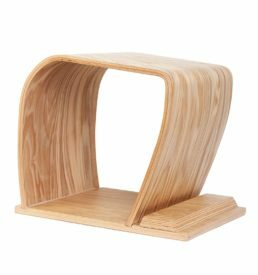 A stool that is also part of bench. Or part of a tunnel. Or a game! It takes a mould weighing 800 kilograms to produce contemporarily the seat of a Flowerssori chair and this unique element. 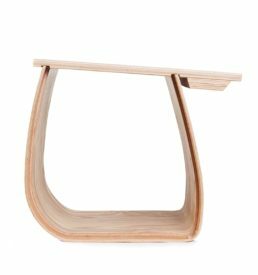 Thanks to the way it is moulded it may be placed next to similar elements, thereby forming a bench. 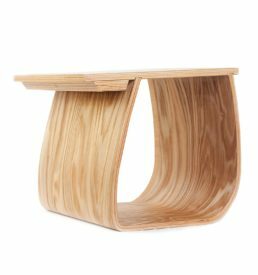 Constructed out of a single leaf of olive-coloured rotary cut ash, just as all the rest of the Flowerssori furniture, it is made exclusively with wood and glue with the lowest possible environmental impact and contains no trace of plastic or metal. 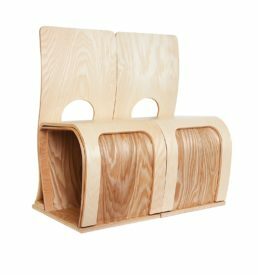 The added value of a project of furniture for children is that its characterising elements, if rotated, can become other objects and create new functions. This is how the Flowerssori bench with backrest was born! By simply stacking the chairs through our stacking system and then rotating it on its base, you easily obtain a comfortable, stable and ergonomic bench. The obvious result is that no precious portion of space is sacrificed by being turned into a chair-stocking area – the chairs may actually be stacked even more compactly, to the point that twice as many chairs and side tables/stools may be placed in exactly the same space. In fact, with exactly the same number of Flowerssori pieces you can furnish different spaces in a dynamic and versatile fashion. 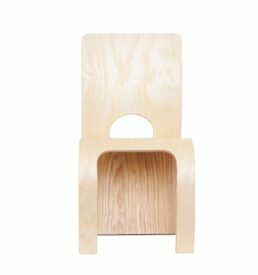 BENCH WITH BACKREST CAT 2 made of rotary cut veneered ash wood and beech, class “0” glue, PEFC and FSC forest management certification, 99% antibacterial coating. The diversity and uniqueness of the colours are due to the rotary cut of the ash wood. The coating, which is compliant with European standards, is stain and scratch resistant. The modularity and flexibility of the Flowerssori products are such that certain configurations, by simply being turned, can fulfill different functions: here is the bench with a backrest that becomes a space divider! Once assembled, the Flowerssori stacking system is something more than a functional storage method. It is a separate and individual piece of Flowerssori furniture, which works as a room divider to create a new and aesthetically intriguing enhancement of the available space. 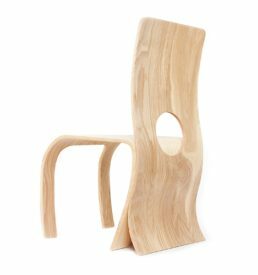 The structures which may be obtained through the assemblage of the chairs and of the side tables/stools may be variously configured, according to both the aesthetic impact factor and the functional requirements which need to be met. 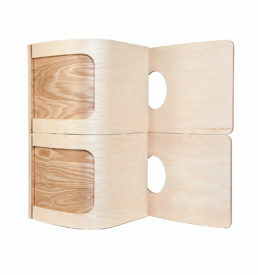 These structures may become compact space dividers or they may be used to create strategic corners, to offer the children suggestions for play or invite them to look through the hole in the chairs, as if from a privileged vantage point, and describe the activities they see taking place on the other side. 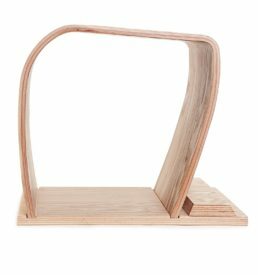 Space divider made of rotary cut veneered ash wood and beech, class “0” glue, PEFC and FSC forest management certification, 99% antibacterial coating. The diversity and uniqueness of colours are due to the rotary cut of the ash wood. The coating varnish, which complies with European standards, is stain and scratch resistant.